Traditional and hearty, yet fresh and seasonal, there is nothing better than British cooking. From the succulent bite of new season asparagus to the satisfying fullness of a roast with all the trimmings, from delicate crab soup to a tangy light summer pudding, the variety of dishes from England, Scotland, Wales and Northern Ireland is stunning. "The Big Book of British Recipes" gives you a superb collection of the best British recipes, all of which are easy to follow and simple to make. The book offers mouth-watering recipes for starters, meat and fish dishes, side dishes, soup and, of course, beautiful puddings. 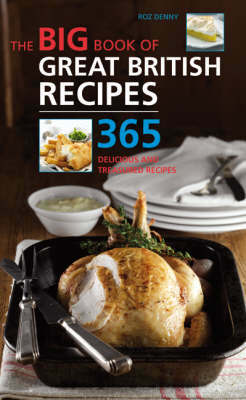 Many classic, memorable recipes are covered, such as braised beef in Guinness, Cornish pasties and apple charlotte as well as exciting recipe ideas for classic British ingredients, such as game and fresh fish. Whether you're cooking a large dinner for your family and friends, or just a simple supper for yourself, you'll find a delicious array of options, from simple, traditional recipes to exquisite, innovative ones. For beginners and more experienced cooks alike, this is a celebration of the best of British.